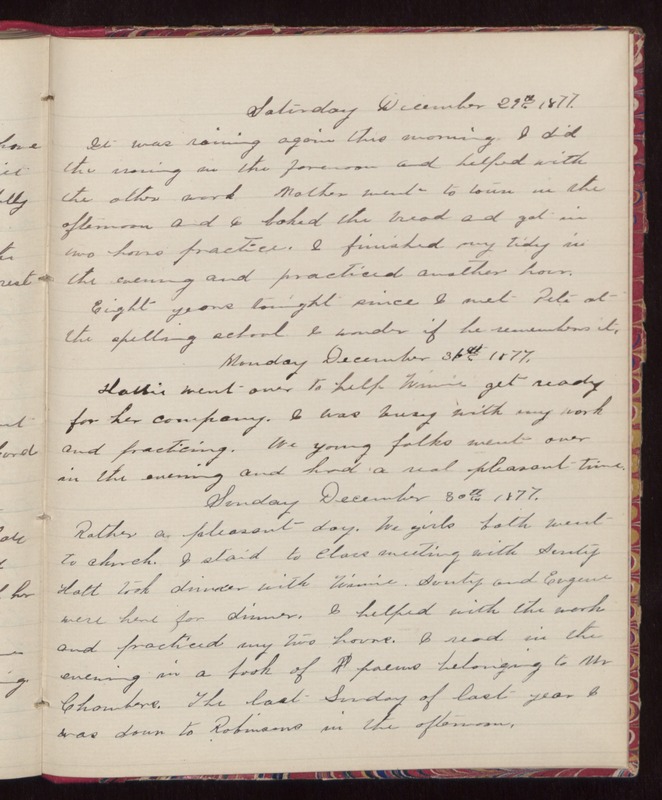 Saturday December 29th 1877. It was raining again this morning. I did the ironing in the forenoon and helped with the other work. Mother went to town in the afternoon and I baked the bread and got in two hours practice. I finished my tidy in the evening and practiced another hour. Eight years tonight since I met Pete at the spelling school. I wonder if he remembers it. Monday December 31st 1877. Hattie went over to help Winnie get ready for her company. I was busy with my work and practicing. We young folks went over in the evening and had a real pleasant time. Sunday December 30th 1877. Rather a pleasant day. We girls both went to church. I staid to class meeting with Aunty Hatt took dinner with Winnie. Aunty and Eugene were here for dinner. I helped with the work and practiced my two hours. I read in the evening in a book of poems belonging to Mr Chambers. The last Sunday of last year I was down to Robinsons in the afternoon.